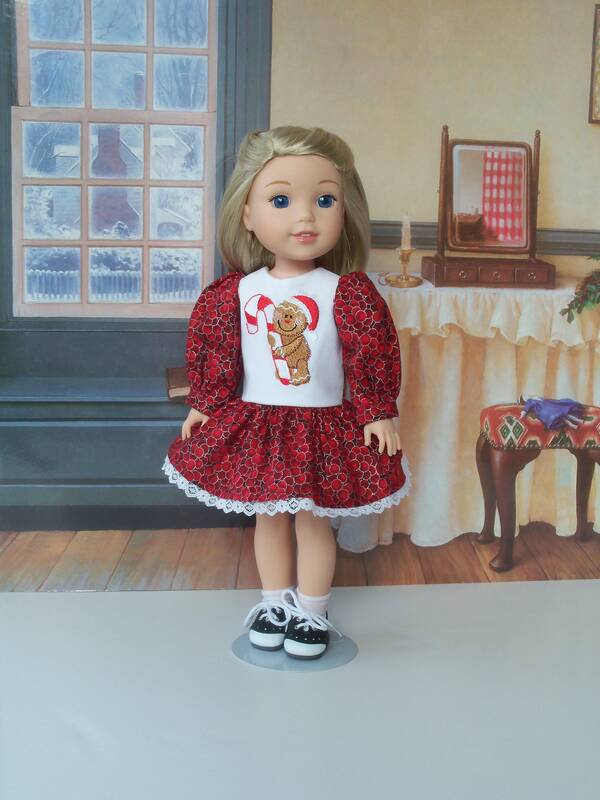 Like American Girl Wellie Wisher Doll Clothes, this Farmcookies doll dress and doll saddle shoes for 14 inch dolls are perfect for the upcoming holidays or any special occasion! This listing for an embroidered holiday dress fits not only Wellie Wishers but also Glitter Girls. Presenting a sweet dress with lovely bodice embroidery. Wellie Wisher® Camille is modeling this dress made from a premium metallic enhanced cotton. The bodice is made from Kona cotton and features a sweet Christmas design. to the lower knee and is adorned with silver metallic trim near the hem. The fully lined dropped bodice is beautifully embroidered in Madeira rayon thread in a happy gingerbread man design. Long full sleeves are cuffed. The dropped mini skirt falls above the knee and is edged in scalloped lace. Dress has my Easy-On feature. The entire back opens and closes with Ultrathin Velcro. Black and White Saddle Shoes go great with this dress! You can add them as an option. All my doll clothes and accessories are made and stored in my smoke-free home. Clothes will be tissue wrapped and sent in a box so they arrive in perfect condition. I ship 1-2 days after purchase via First Class mail. Doll and socks not included in the listing. I accept Pay Pal, Etsy Gift Cards, and Master Card or Visa through Direct Checkout. E-checks through Pay Pal are also accepted; however shipping is delayed until Pay Pal notification of cleared check. Payment is due within 24 hours of purchase. I ship Monday through Friday usually within 24-48 hours of purchase. Friday sales are mailed first thing Monday morning. 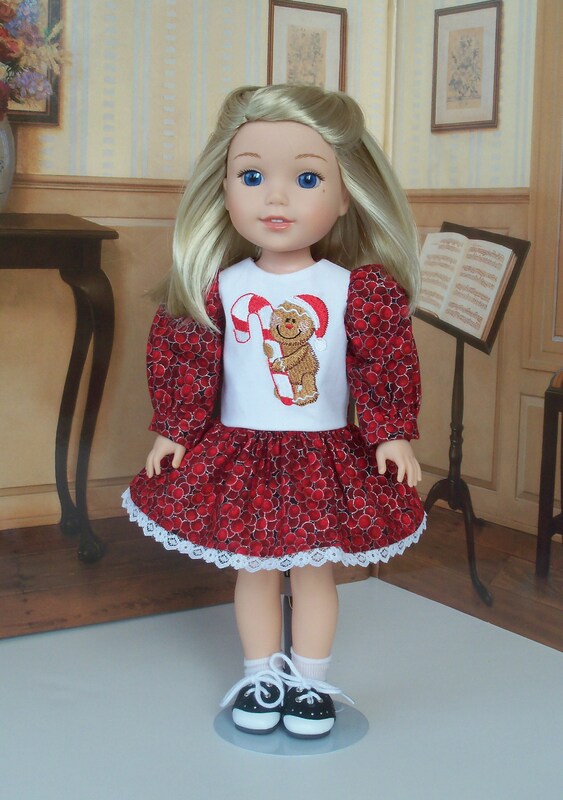 My doll clothes are lovingly wrapped in tissue paper and mailed in a box via First Class US Mail; if you are interested in Priority Mail, please Convo me and I can arrange an upgrade. ** PLEASE NOTE: Due to problems with First Class International Shipping I will only ship Priority Mail to the following locations: Asia, Africa and South America. I accept returns for doll clothes if you feel I have misrepresented the outfit. Please ask any questions before buying.There is no reimbursement for original or return shipping charges. Returned item must be in new, unplayed with condition and returned within 10 days of purchase. All custom orders, reserved listings, and special requests are final sale and cannot be returned or exchanged. All custom orders required a 50% non-refundable deposit. Balance is due on custom orders within 7 days of the posted listing. Custom items not purchased within 7 days will be forfeited and deposit will not be refunded unless other arrangements have been made. I do not accept returns or offer refunds for sewing patterns, either printed or PDF format. PLEASE ask questions before buying. Once again I stress that my patterns are not professionally drafted, nor are most the standard plain white pieces. My homespun patterns are easy, quick to finish and will fit your doll well. Thank you for reading and accepting my terms of sale. INTERNATIONAL CUSTOMERS PLEASE READ: For Items shipped outside of the United States please be aware that your country may impose a VAT (Value Added Tax) on your purchase. You are wholly responsible for any and all VAT import duties or taxes added to your purchase and due to your government. Priority Mail International is required for the following locations: Asia, Africa and South America. We are the sole owners of the information collected on this site. We only have access to/collect information that you voluntarily give us via email, Convos or other direct contact from you. We will not sell or rent this information to anyone. It is used solely to discuss, complete and/or refund orders. We will use your information to respond to you, regarding the reason you contacted us. We will not share your information with any third party outside of our organization, other than as necessary to fulfill your request, e.g. - the Post Office to ship an order. We take precautions to protect your information. When you submit sensitive information (credit card or Pay Pal data) via the website, your information is protected both online and offline by Etsy- I do not have access to that information. Your name, address, phone number and other personal information are kept secure. Only employees who need the information to perform a specific job (for example, billing, setting up Custom Listings or customer service) are granted access to personally identifiable information. The computers/servers in which we store personally identifiable information are kept in a secure environment.